World War I left Berlin, and all of Germany, devastated. Charlatans and demagogues eagerly exploited the desperate crowds. Fascination with the occult was everywhere in private seances, personalized psychic readings, communions with the dead as people struggled to escape the grim reality of their lives. In the early 1930s, the most famous mentalist in the German capital was Erik Jan Hanussen, a Jewish mind reader originally from Vienna who became so popular in Berlin that he rubbed elbows with high ranking Nazis, became close with top Storm Troopers, and even advised Hitler. Called "Europe's Greatest Oracle Since Nostradamus," Hanussen assumed he could manipulate some of the more incendiary personalities of his time just as he had manipulated his fans. He turned his occult newspaper in Berlin into a Nazi propaganda paper, personally assured Hitler that the stars were aligned in his favor, and predicted the infamous Reichstag Fire that would solidify the Nazis' grip on Germany. 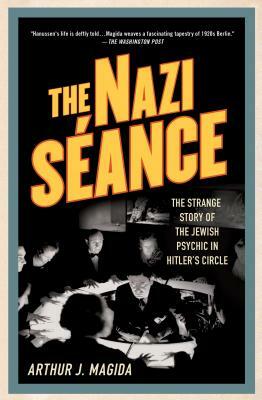 Seasoned with ruminations about wonder and magic (and explanations of Hanussen's tricks), "The Nazi Seance" is a disturbing journey into a Germany as it descends into madness aided by a "clairvoyant" Jew oblivious to the savagery of men who pursued a Reich they fantasized would last 1,000 years. Arthur J. Magida is writer-in-residence at the University of Baltimore and an adjunct professor at Georgetown University. He has been a columnist for Beliefnet.com, a contributing correspondent to PBS's Religion & Ethics Newsweekly, senior editor of the Baltimore Jewish Times, environmental reporter for National Journal, and a writer and editor for Ralph Nader. He has receivedmultiple Simon Rockower Awards from the American Jewish Press Association, A.D. Emmart Awards for writing on the humanities, and Smolar Awards for Excellence in Jewish Journalism. He lives in Baltimore, Maryland.